Hands and fingers are some of the most useful and complicated tools on the planet. But what can we learn from studying them? A great deal, according to Vincent Hayward, a professor at the Institut des Systèmes Intelligents et de Robotique and the Université Pierre et Marie Curie, both of which are located in Paris, France. 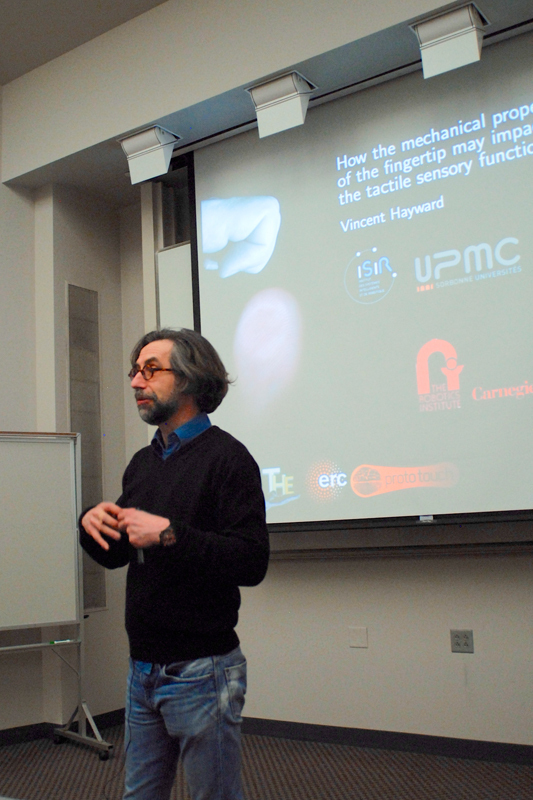 Hayward presented a talk at Carnegie Mellon on Friday titled “How the mechanics of the fingertip impact the tactile and gripping function of the hand,” as part of the Robotics Institute lecture series. Hayward’s work deals primarily with haptics, which he described as “the phenomenon of hand guidance by touch.” The scope of haptics technology can range from small molecules to macroscopic systems, the most familiar being touch screens. Hayward began his talk by introducing the complexities, mysteries, and abilities of human fingertips. He noted that fingertips have unique skin compared to other regions of the body and that this skin is connected to the bone by a network of collagen fibers — the main component of connective tissue. He also noted that the bottom of the skin is made of keratin, a tough structural tissue that is the primary material in skin, hair, and nails. The mechanics behind fingers and hands are also especially interesting. A hand is able to have a very good grip by simply being there. Placed on a flat surface, the contact made by a finger is very close to a circle. Fingers also have the ability to stiffen, and are able to grab objects of different weight between five orders of magnitude — from a fine feather to a coarse heavy weight. All of these abilities make the finger a fascinating subject. In working with fingers, Hayward had multiple questions, the key question being: How does the hand discriminate between all these different surfaces? Hayward hopes to learn more about the interaction between fingers and surfaces to improve technologies which utilize tactile feedback. Hayward mentioned many previous studies and experiments that dealt with understanding the mechanics of finger movement and texture perception. These experiments involved a participant placing their finger in a sort of groove. Researchers then applied different tactile surfaces, which forced the fingertip to attempt to measure what was happening on the surface. Overall, it was found that friction between the minuscule ridges of the finger and the surface played a great deal in perception of different textures. Hayward looked at research regarding the contact between fingers and surfaces used in technology. He focused on the slipping that sometimes occurs when one is using a touch pad or screen. One of the main causes of slipping is the secretion from the relatively large number of sweat glands under fingertips. He also discussed how the sliding velocity of a fingertip will vary with different surface materials. When one moves a finger along a touch screen, the increase in secretion from the sweat glands changes the conformation of the finger ridges and results in a wider contact area between the finger and the surface, resulting in increased friction. This effect works the opposite way on a porous surface like paper, which will absorb fluid and decrease friction over long periods of contact. Consequently, contrary to what one might expect, the coefficient of friction between a fingertip and a surface will increase if that surface is smooth, like glass, and decrease if that surface is coarse, like paper. Hayward ultimately hopes that further research into the precise mechanisms of touch will help develop better technology like pads, as well as robots. In his review article on the subject, “Finger pad friction and its role in grip and touch,” Hayward mentions the importance of touch technology in robotics and prosthetics. New materials that more closely mimic the real experience of human touch will ultimately lead to greatly enhanced functions.